US Ambassador to the United Nations Nikki Haley says the United States is not looking for war with North Korea, and that Pyongyang has “not yet passed the point of no return”. The United Nations Security Council has agreed on its toughest-ever sanctions against North Korea that passed unanimously after the United States softened its initial demands to win support from China and Russia. The sanctions set limits on North Korea’s oil imports and banned its textile exports in an effort to deprive the reclusive nation of the income it needs to maintain its nuclear and ballistic missile programme, and increase the pressure to negotiate a way out of punishing sanctions. North Korea was condemned globally for its latest nuclear test on September 3, which it said was of an advanced hydrogen bomb. It was the ninth sanctions resolution against North Korea that has been unanimously adopted by the 15-member council since 2006. Ambassadors to the UN vote during a United Nations Security Council meeting on North Korea. “The stronger the sanctions we impose on North Korea, the stronger our hand in promoting a political solution,” said French UN Ambassador François Delattre ahead of the deliberations. The new sanctions ratchet up to the pressure on North Korea, though they are far less sweeping than what Washington originally sought after Pyongyang carried out its sixth and most potent nuclear test. North Korean leader Kim Jong Un has conducted six nuclear tests, and now more than 90 per cent of his country’s reported exports are under sanctions. But the US agreed to drop several key demands, and toned down others, to keep China and Russia from exercising their veto over the measure. 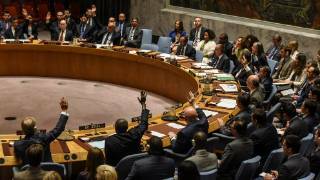 A Security Council resolution needs nine votes in favour and no vetoes to pass. In negotiations on the latest resolution, diplomats said Russia had questioned what leverage the Security Council would have left if North Korea continued to conduct nuclear and missile testing. A week ago, US Ambassador to the United Nations Nikki Haley called for the “strongest possible” sanctions on North Korea and had sought an oil embargo on Pyongyang. On Monday, Haley said the United States was not looking for war with North Korea and that Pyongyang had “not yet passed the point of no return”. “If it agrees to stop its nuclear programme, it can reclaim its future. 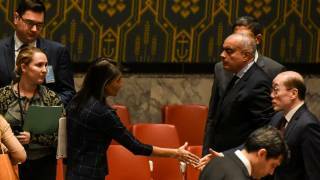 If it proves it can live in peace, the world will live in peace with it,” she told the Security Council after the council adopted the new sanctions. Haley added that the latest resolution “would not have happened” without the strong relationship that had developed between US President Donald Trump and Chinese President Xi Jinping. The new set of sanctions come on top of previous sanctions that cut into North Korea’s exports of coal, iron ore and seafood. A US official familiar with the negotiations over the resolution said more than 90 per cent of North Korea’s reported exports are now covered by sanctions. Textiles were North Korea’s second-biggest export after coal and other minerals in 2016, totaling US$752 million (NZ$1.04 billion), according to data from the Korea Trade-Investment Promotion Agency. Nearly 80 per cent of the textile exports went to China. The resolution imposes a ban on condensates and natural gas liquids, a cap of 2 million barrels a year on refined petroleum products, and a cap on crude oil exports to North Korea at current levels. China supplies most of North Korea’s crude. A US official, familiar with the council negotiations and speaking on condition of anonymity, said North Korea imports some 4.5 million barrels of refined petroleum products annually and 4 million barrels of crude oil. China’s UN Ambassador Liu Jieyi called on North Korea to “take seriously the expectations and will of the international community” to halt its nuclear and ballistic missile development, and called on all parties to remain “cool-headed” and not stoke tensions. Liu said relevant parties should resume negotiations “sooner rather than later”. To kick-start talks, China and Russia have proposed a dual suspension of North Korea’s nuclear and ballistic missile testing as well as US and South Korean military exercises. “We think it’s a big mistake to underestimate this Russia, China initiative. It remains on the table at the Security Council and we will insist on it being considered,” Russian UN Ambassador Vassily Nebenzia told the Security Council. 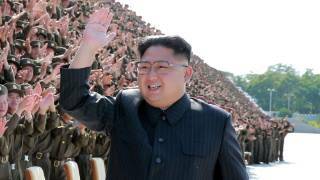 Pyongyang warned the United States on Monday that it would pay a “due price” for spearheading efforts on UN sanctions. “The world will witness how the DPRK tames the US gangsters by taking a series of actions tougher than they have ever envisaged,” the foreign ministry said in a statement carried by the official KCNA news agency. DPRK stands for the North’s formal name, the Democratic People’s Republic of Korea. European Council on Foreign Relations UN expert Richard Gowan said the United States had “rather predictably been mugged by reality” during the most recent negotiations on sanctions. He added it was arguable, however, that the high US bar had pushed China and Russia to agree to more limited sanctions “relatively quickly”. China supplies most of North Korea’s crude. Chinese officials have privately expressed fears that an oil embargo could risk causing massive instability in its neighbour. “I have said before that China agrees that the UN Security Council should make a further response and necessary actions with respect to North Korea’s sixth nuclear test,” he told reporters.